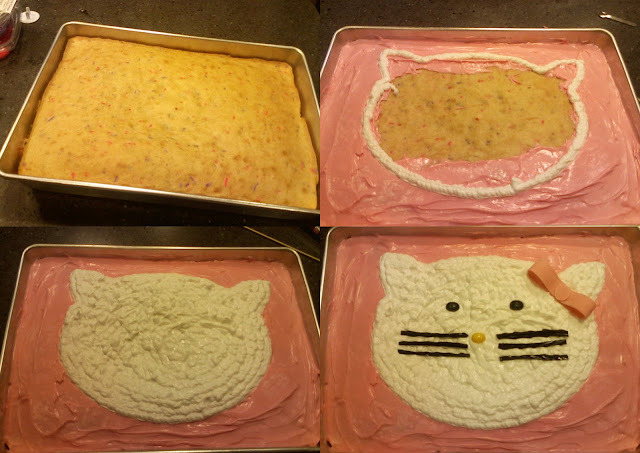 After much debate and changing her mind about 4 times, Grace decided she wanted a Hello Kitty Birthday Party. Here is my attempt at making her cake. I think it resembles Hello Kitty....what do you think? I love this adorable little cupcake stand. I bought it the Saturday after Christmas at TJ Max for $5. My finished creation..complete with jelly bean eyes and nose, licorice whiskers, and a Bubbletape bow. Birthday Girl enjoying cake and ice cream with her cousins. More great family...sorry I caught y'all eating! Play Food, Yippeee :) Now I can serve Mommy and Daddy some home made cookies. Thanks to everyone who came and helped us celebrate a very special 4 year old! ADORABLE cake and party! Looks like you did a great job! You did a fantastic job on her cake!! We had Brea's 2nd birthday the hello kitty theme and I just love their stuff. reminds me of when I was a kid. Great pics!! I know this has been said but you did a great job with the cake, very creative. I'm sure Grace loved every minute. Happy birthday. You look like a princes.